When you're practically surrounded by water and world famous for oustanding chefs and recipes, seafood is a given. Your only decision is how you'd like it prepared - grilled, fried, sauteed- and what kind of view you'd like to have while you enjoy it. In the column to the left, we have recommended a few restaurants in each of the Charleston areas you may want to visit - Downtown, North Charleston, Mt. Pleasant, Summerville, Sullivan's Island, Isle of Palms, John's Island, Daniel Island, Kiawah Island and Seabrook Island. We have featured some of the restaurants from different areas of Charleston, so after your round of golf, you can enjoy some of the best food available in the South. For more than 24 years, guests at 82 Queen have been impressed by her southern charm, superb service and fresh local cuisine. Like stepping back in time, nothing compares to the fine dining experience offered by this charming restaurant nestled in Charleston’s historic French Quarter. Authentic Lowcountry cuisine, simple, yet complex in its preparation, coupled with an award-winning wine list, make dining at 82 Queen an incomparable experience. We recommend a cup of their famous She-Crab soup and the Jumbo Lump Crab Stuffed Flounder over creamy grits and fried green tomatoes topped with a lobster cream sauce. 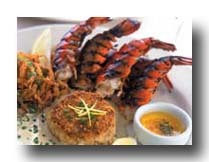 North Towne Grill and Seafood uses only the finest and freshest ingredients in the preparation of all of our dishes. Their broad selection has something for everyone: slow roasted chicken, grilled, broiled, steamed, or fried seafood, flame-grilled steaks and shish kabobs, salads, vegetarian meals, childrens dishes, and the best Greek dishes you have ever tasted. Plus, they feature over ten delicious deserts, cappuccino, and a full bar. We recommend the Broiled Seafood Platter - a combination of shrimp, scallops and fresh flounder fillet broiled to perfection. "The Best Fried Shrimp - Anywhere". Their fried platters are great, but if you're hungry for some really outstanding seafood, we recommend the Shellfish Pot - 6oz of snow crab legs, 10oz of Dungeness crab legs, Shrimp (9), Clams (3), Mussels (3), & Select Oysters ( 6), served in a cast iron pot. While the South Carolina Lowcountry is famous for its food, this historic and romantic region's finest cooking may be enjoyed at Woodlands Resort & Inn, the state's only Mobil 5-Star and American Automobile Association's (AAA) Five Diamond dining room. Menus change daily to incorporate the freshest, most delectable ingredients gathered from private gardeners, day-boat fishermen and farmers. "Simply Fresh Seafood" is the philosophy behind the cuisine at the legendary Boathouse restaurants of Charleston, South Carolina with rich portions of innovative low country cuisine, skillfully prepared seafood & raw bar selections, straight off the boat nightly specials, impeccably served and certain to delight every palate. Additional Boathouse specialties include hearty steaks, flavorful pastas, and in-house smoked chops - favorite selections of both old customers and new, as well as non-seafood enthusiasts. 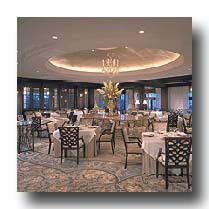 Kiawah's signature and specialty restaurant. Named "Restaurant of the Year" by The Post and Courier. It offers an epicurean experience composed of refined cuisine, with an emphasis on seafood, pampering service and dramatic ocean views. Two private dining rooms and an elegant lounge furnished in mahogany and leather enhance this incomparable oceanfront dining room.